We are smack dab in the middle of an exciting project at 12 Oaks— creating a playroom and mudroom from what was a weird den/office. This is what the room was looking like before we started. We hardly ever used it and it is basically the last room in the house we haven’t renovated. We had a desk in one corner (that we never use), and Kate had some toys in there, and that is about it. The fireplace takes up half of the room, it’s dangerous for little ones and would need to be re-done anyway, so we decided to cover it up (GASP!) Some may think that is a crime but it just didn’t work for our family and our needs. 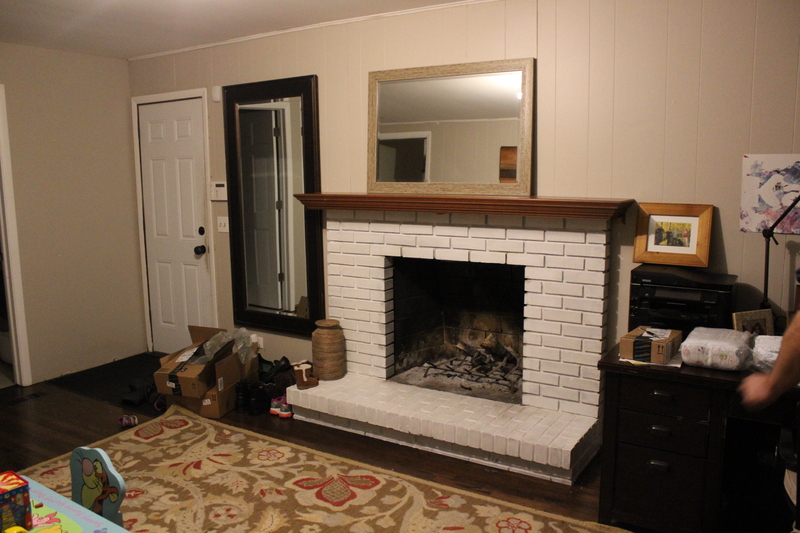 We still have a much nicer fireplace in our living room, and could always open it back up down the line if we wanted to. 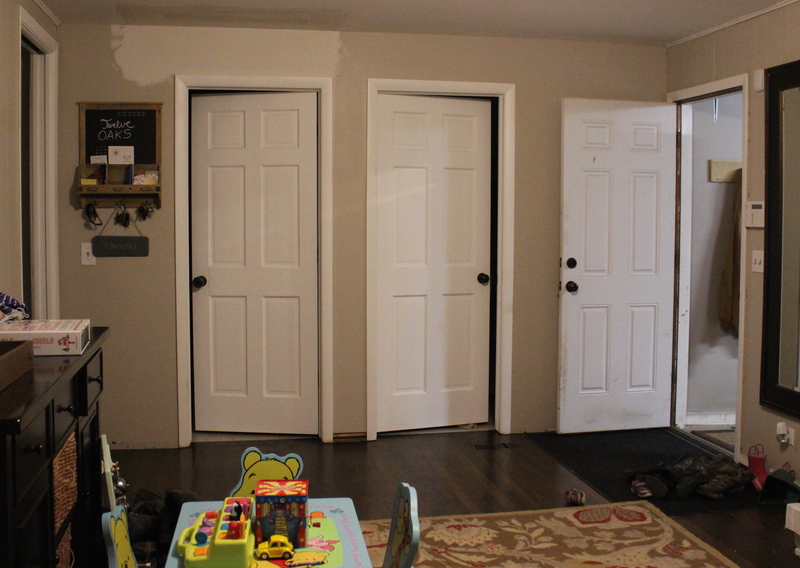 Here’s the other side of the room, the door to the garage is on the right, the laundry room and powder room are in the center, and the doorway on the left leads to the kitchen. So this room was basically a pass through as we came in the house and took off our shoes, coats, brought in groceries, etc. 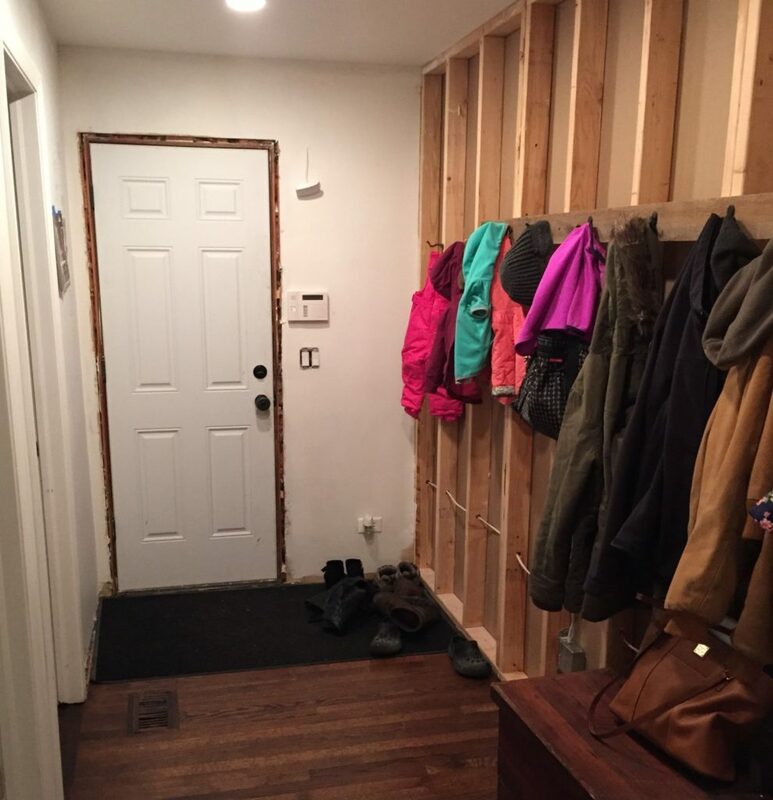 We decided to put up a wall here to make a nice mudroom off of the garage, and then it closes off the playroom to make a cozy little room for Kate to play in. 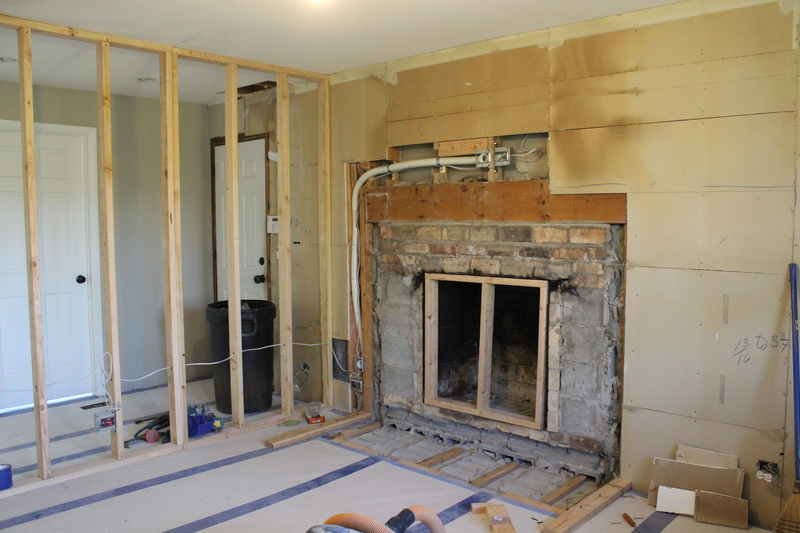 So first things first we cleaned out the room, ripped out the fireplace and removed the paneling from the walls. 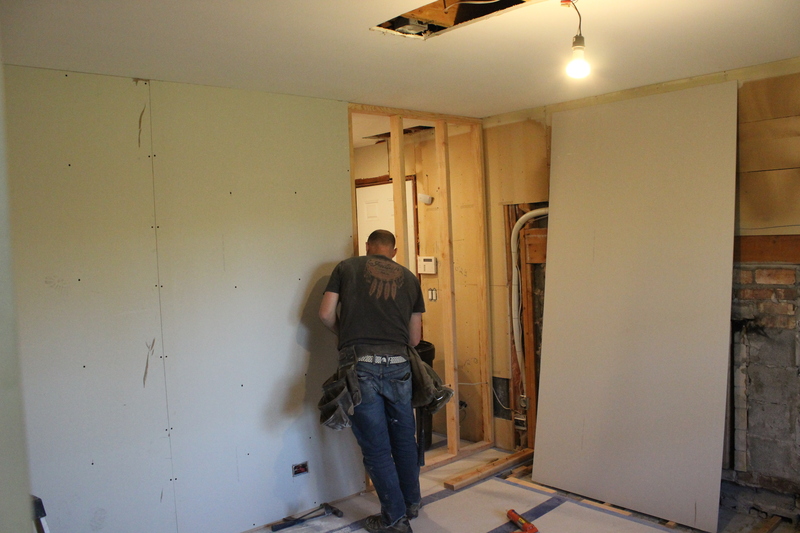 We were happy to find drywall (unfinished) behind the paneling, so we only had to hire drywallers to finish it rather than hang new stuff too. Next Ben built the wall…. Then we had an electrician come in to add some can lights in the new mudroom, center the light in the playroom, and add some outlets. 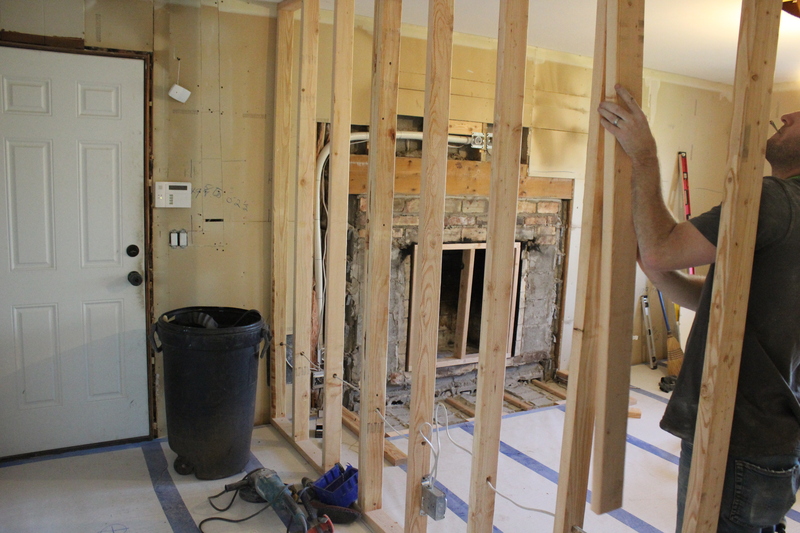 Then Ben hung drywall on the new wall and over the old fireplace. 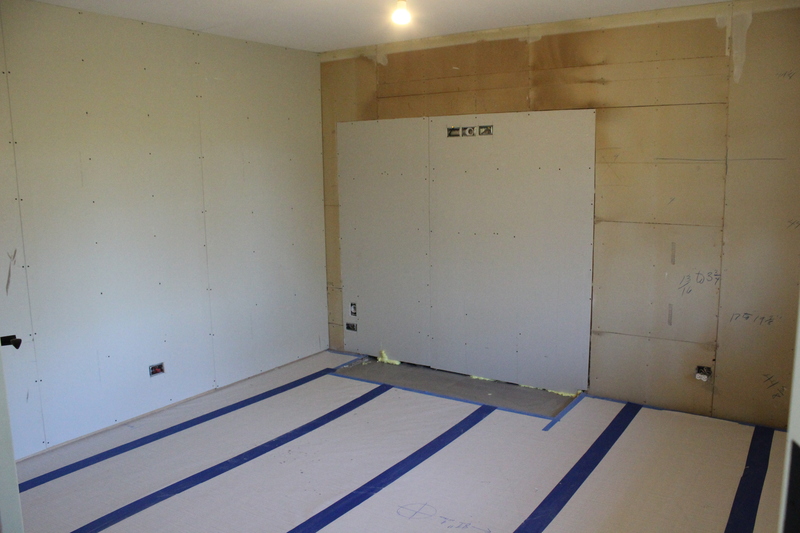 Next we had the drywallers come in to tape and finish the drywall. And then Ben primed all the walls. 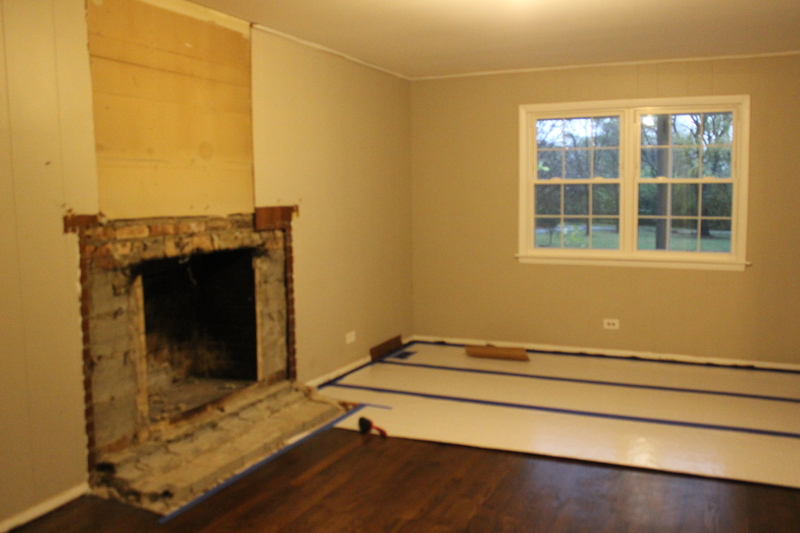 Unfortunately we also had to re-do the hardwood floors because of the old fireplace hearth that left a big hole in the floor. So the flooring guys patched the hole, sanded all of them back, and re-stained them to match the rest of the house. You can’t even tell the fireplace was there. 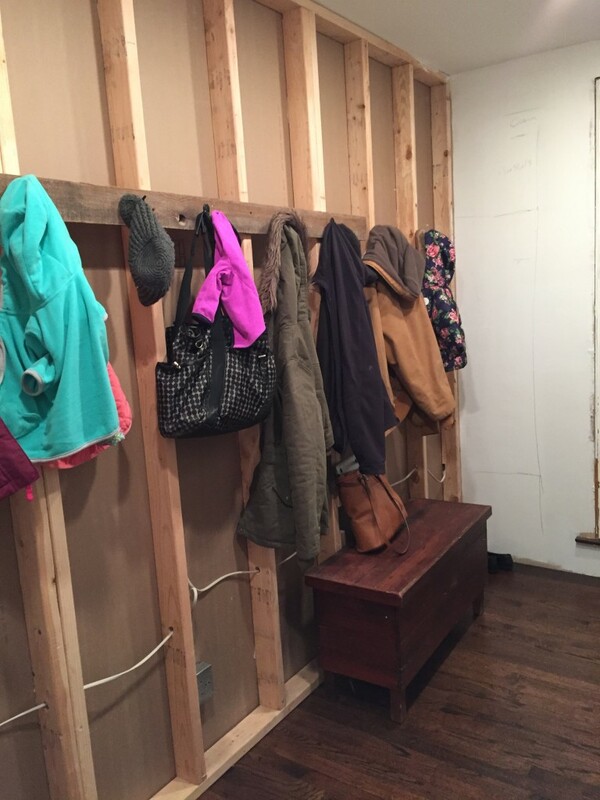 Here’s how the mudroom is shaping up so far. We are building floor to ceiling cabinets in here, but it is already so much better! Ben threw together a hook rail so we can hang all our stuff as soon as we come in the door. 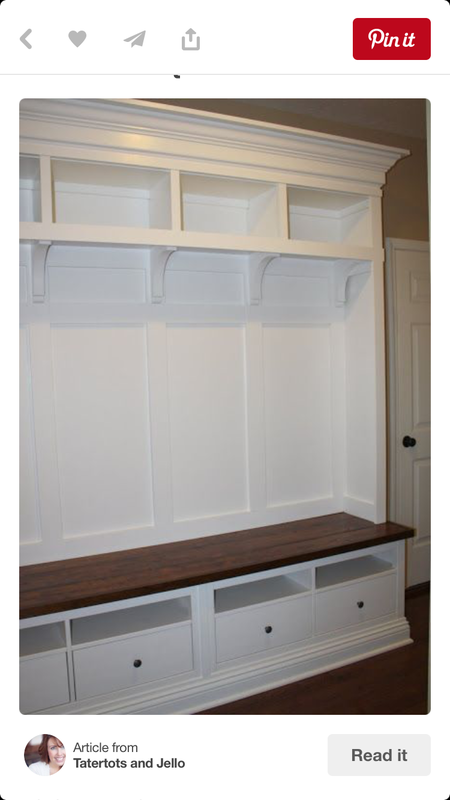 Here is some of my inspiration for the mudroom cabinets. I cannot wait! 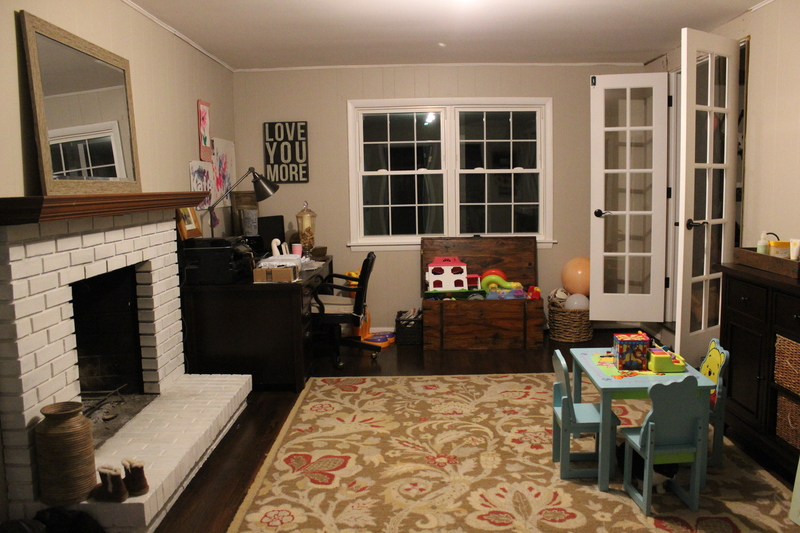 We’ve already painted the playroom and have started putting it all back together, so I hope to share a finished reveal before the end of the year. 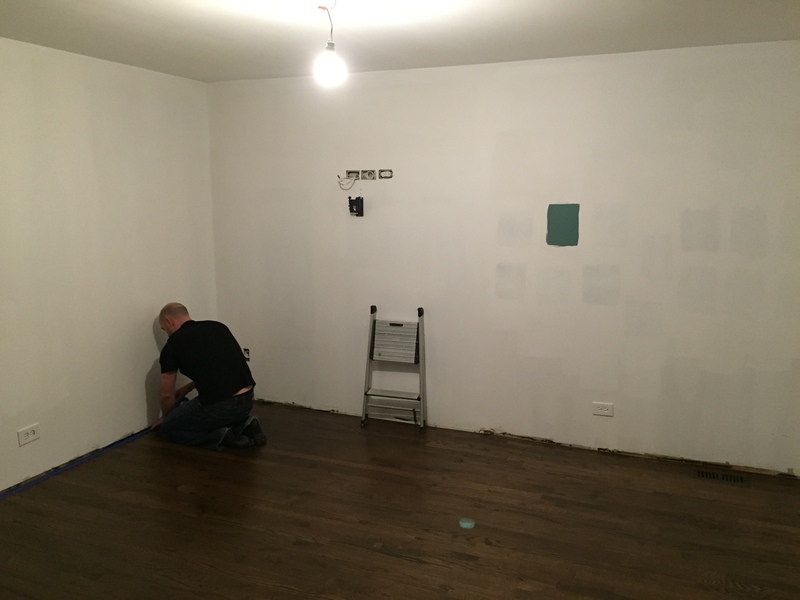 Question on the hardwoods… how do you know what wood to match the existing floors? The hardwood flooring contractor took a look and he can tell by looking at it. You are doing an amazing job. – I love watching your blog. Happy New Year to all. – Auntie Ros. Thanks Rosslyn. Getting there… Happy New Year. 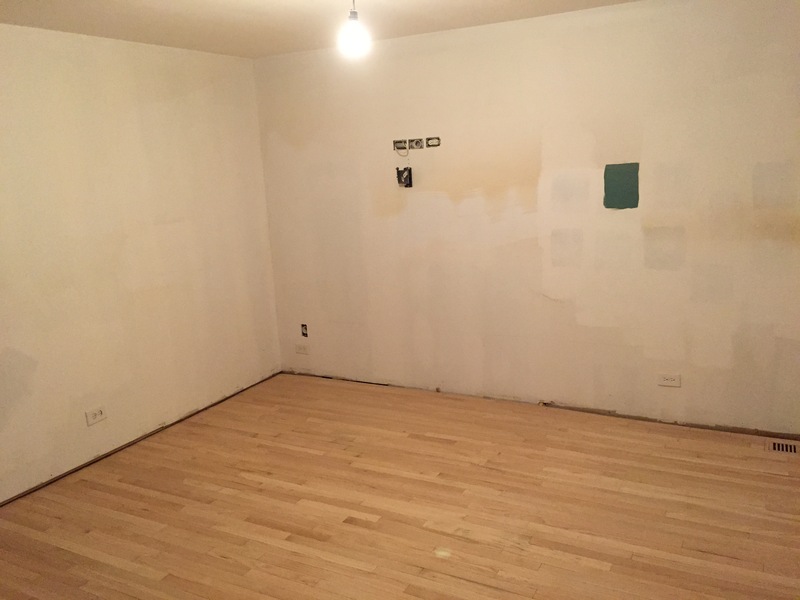 Hi, we're Ben and Amanda, two DIYers tackling the renovation of a foreclosure in the Chicago suburbs. Watch as we transform the house and 5-acre property into a home to be proud of. Visit 12 Oaks Blog's profile on Pinterest. Some of the links on this site are affiliate links which means I may make a commission off of clicks or purchases. As always, I will only promote items I like and/or use.